It’s been a while since I reviewed Yugioh Zexal and I actually finished this show at around the same time so this is long overdue. This is the final review that was buried in my backlog for a while so it’s good to have it all done. Yugioh 5D’s is easily in my top 10 favorite shows of all time like I’ve mentioned several times on the site. 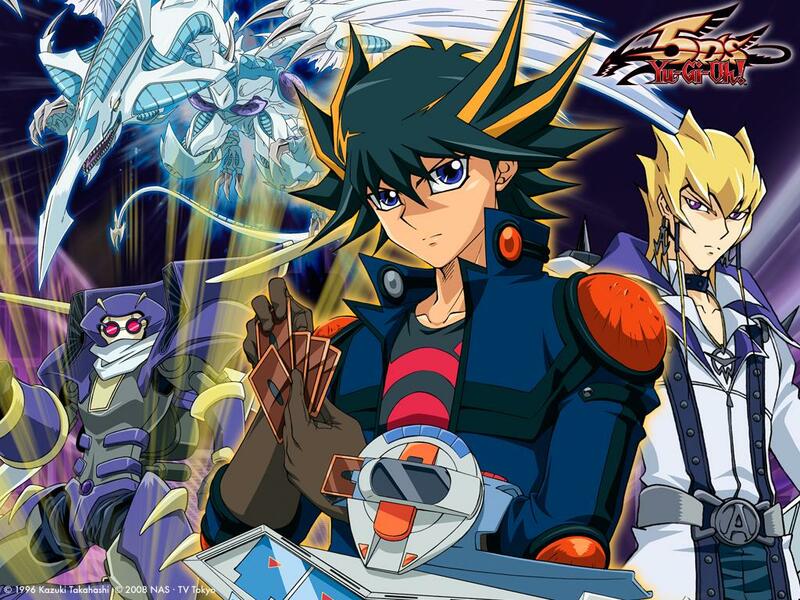 It’s just about perfect and easily deserves to be known as one of the best Yugioh series…even dethroning the original. The series takes place far in the future. You can essentially say that it is canon to the older series or not, it doesn’t really matter as it is so far in the future that none of the older characters or their monsters will be appearing. A large accident split the country in two and all of the rich people live in the glamorous Domino City while the poor live in Satellite, hunted by the cops. Yusei decides that he wants to head to Domino City and he arrives just in time to enter a tournament. The first arc is mainly about the big tournament and then the organizer of the whole thing, Mr. Goodwin, turns out to be a little corrupt. Longtime Yugioh fans or any anime fan will likely see it coming, but it’s still fun as he makes for a good starter villain. I enjoyed this arc although it was fairly short, but I feel like I would enjoy it a whole lot more now. While the tournament was epic, we hadn’t known any of the characters yet. Tournaments are actually a great way of introducing characters for sure, but the second watch makes it all the more meaningful since you now know them more and can appreciate their older days. Of course, the series would just get better and better from here. Mainly because Yusei’s old friends stopped appearing here as well and his newer ones were a lot cooler. The second arc is the fan favorite one and it was a lot of fun. The main characters found out that they were actually chosen by the Crimson Dragon as the only ones who could stop the Dark Signers. One of them also had a history with Yusei as they both grew up in Satellite, but betrayal and disagreements between the teammates separated all of them. A reporter also gave into the dark side and there were many intense duels in the show as well as Yusei’s first real challenge. The stakes definitely went up for this arc and we got quite a few epic fights. The animation also went to the next level. Finally, we had the World Grand Prix arc. This one was easily the longest and also had some filler, which won’t be too cool for some fans. Basically, this arc finally put the motorcycles back into the show. Instead of the standing duels like in the older shows, the motorcycles came into play as Yusei and his friends had to prove that they were the best in the world or the new villain group would plunge the world back into darkness. This arc introduced a whole lot of new characters. A lot of them were one shots of course, but that’s just how it goes. The tournament battles were extremely exciting and that’s why I loved the arc so much. As I mentioned earlier, once you know the characters, the tournaments get to be even more fun. A lot of the new teams were also cool or at least made for good fights. The climax in each of the arcs was very exciting as Yugioh climaxes are always spectacular, but the final battle in the final arc was definitely the best one. We got some really epic opera themes at the last second and the villain really lasted quite a while. Ending the series on a high note is always important. 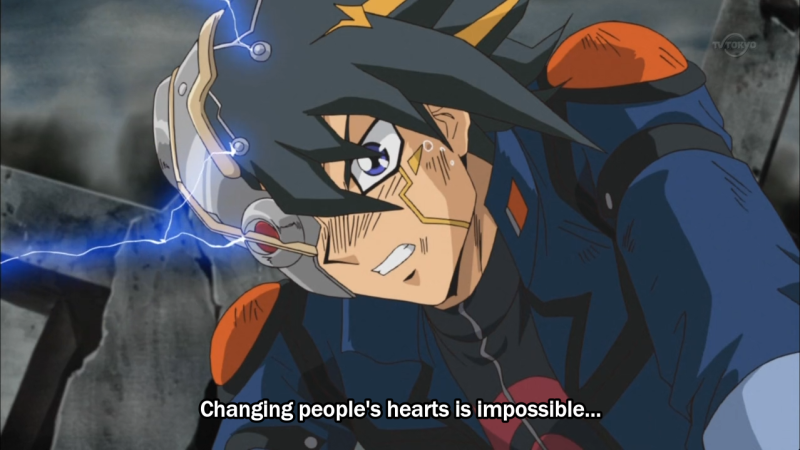 Yugioh 5D’s main gimmick, which a lot of fans had fun with is that the characters now duel while on motorcycles. It’s a pretty interesting twist and while standing duels will always be my favorite, it does make for some nice visuals. It’s fun to see such a high speed duel and the tournaments handled it quite well. It did help to differentiate it from the other Yugioh series, that’s for sure. I also think that Synchro Summoning is a whole lot better than the XYZ style from Zexal. It was a new feature that was actually a lot of fun and wasn’t too overpowered. That being said, the final cards are naturally extremely powerful. The final ones that the villains have can essentially do anything within the rules of the game. While not as OP as the Yubel card in Yugioh GX, it’s safe to say that they can hold their own against any of the other final bosses. Each of the Time Lords has a different special ability and once you’ve got the whole army on your side, it’s game over for your opponent. 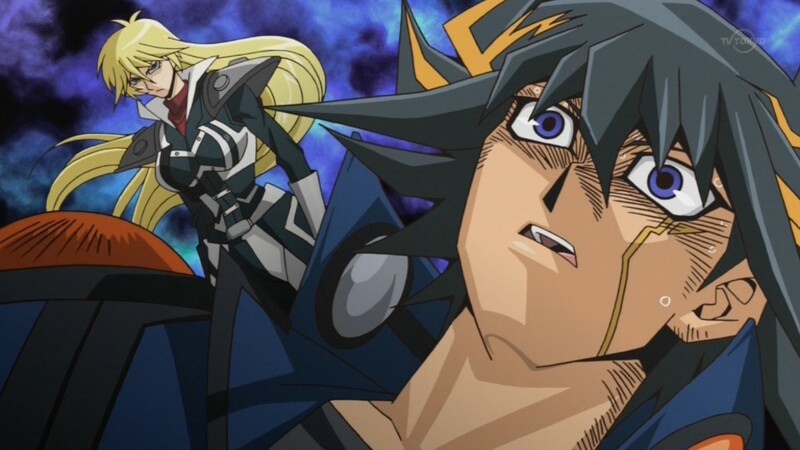 As you would expect, the animation in Yugioh 5D’s is top notch. It actually looks better than Yugioh Zexal and is automatically the best animated Yugioh series. I don’t even think that Yugioh Arc V will be able to pass it in that area. The series had a theatrical effect to it so the night duels looked especially good while the daytime ones were superb as well. 5D’s really excelled in that area. The Earthbound Immortals are completely in CGI so you may have a chuckle when those guys come out of the woodworks. The CGI is certainly obvious and they would have looked better hand drawn, but at least they got the scale wrong. I much preferred the other big cards as I wasn’t impressed with these guys, but the CGI…you will never forget it! Now, we can’t forget about the soundtrack right!? Yugioh 5D’s gets 5 stars there as well. I got to watch the first two arcs in English for the Dub music and the final one subbed for the Japanese themes. The Dub wins as expected, but both versions are quite good. For the Dub, we got a lot of fast paced action themes that really fit with the duels and it was second only to GX in Yugioh world. I also liked the voices and missed them a lot when the Dub ended. For the Sub, I love Jack’s theme and would probably rank it as the best subbed theme with the opera one from the final boss being a close second. I also like the techno theme for when Speed World is activated. Since I got to hear two different soundtracks, it helped this show ultimately have more likable themes than most shows could ever hope to have. Another star to add to Yugioh 5D’s book. The writing is also exceptional for the series. I’d actually say that every single Yugioh title has been quite good with the writing as they all tend to tackle some deep themes and know when to be serious as well as when to be light toned again. Yugioh 5Ds is no exception and it deals with the end of the world and how humanity can be pretty corrupt and whether it should be saved or not. Another topic is how much of a price are the characters willing to pay to save the rest of the human race. The episodes will always get you thinking and the series is always very interesting as well as exciting, which is an incredible combo. The show is also very long. With over 150 episodes, you have a lot of time to get attached to the characters and watch their character progression. Character development is very real in this series after all. While some of the characters will never be likable like Yusei’s old friends, most of the main cast is quite good and the villains are solid. On that note, let’s talk about the characters, as the show has a decently large cast. Yusei is the main character of Yugioh 5D’s and he is certainly a likable character. He’s a natural leader and he gets the job done. While not as overly happy and upbeat as Yuma, Yusei’s still a fairly cheerful guy to hang out with. He started out as a very serious guy, but his friends helped him to just enjoy everything a little more. He rarely ever lost to anyone in the whole series and I believe that he only lost on screen once if a commentor is to be believed on Youtube. I can’t verify this as it’s been a while, but if so…that’s very impressive. His deck is fairly balanced and it’s actually better than Yugi’s if you ask me. I like his Junk Warrior and his Stardust Dragon is a lot of fun. Yusei’s Iron Scarecrow is also a very good trap card as it can block an attack and never leaves his field. Really, Yusei may have gotten the best starter deck out of all the main characters including Jaden. It’s quite good and very powerful. It’s definitely hard to be a better lead than Yusei as I really had no problems with the character. Akiza is the main heroine of the series and her telekenetic abilities were enjoyable to see as most Yugioh characters do not have any physical abilities. She can also duel, which instantly makes her cooler than Tea and Tori. I’d also say that she beats Alexis, making Akiza the best main heroine from the Yugioh franchise. Her flower deck is solid and her dragon also has some neat abilities at its disposal although I wouldn’t call it as impressive as some of the others in the series. While Akiza may not be quite as powerful as Jack or Yusei, she can hold her own in a fight. Her battle with the Dark Signer Misty was a lot of fun. She lost her abilities for a good chunk of the series, which was unfortunate, but maybe she would have been too overpowered with them. Either way, I’m glad that she got them back for a time. Jack Atlas started out as a very antagonistic character. He was friends with Yusei, but set his sights on grander pastures and left his old friends. He was deceived for a while into believing that he was the King when his opponents had been throwing fights. This left him with a chip on his shoulders that he tried to get rid of during the whole series. His skills were very real though and his Red Dragon Archfiend is probably the best dragon from all of them. He’s incredibly powerful and is very useful in a fight. Jack’s aggressive playing style makes him a blast to watch. While he learns to be more strategic in the end, he never loses that fiery passion for dueling. Crow joined the group a little later into the show. I feel like the writers didn’t even know that they were going to add him in so his inclusion into the story just came out of nowhere. I feel like he never proved himself quite as well as the other three characters and I still don’t find him to be quite as impressive in terms of dueling either. Even his dragon is a little on the weak side. That being said, he’s certainly not a bad character and is still a nice guy. While he may not have been developed quite as much, Crow definitely got his share of important duels in the show. Leo and Luna were the final main members of the group. Leo always wanted to be one of the heroes and he finally got his chance by the end. His Power Tool Dragon was never that strong, but he was a decent card. Leo always meant well, but he was basically a kid at the grown ups table. Luna had her Ancient Fairy Dragon who also wasn’t too impressive, but was a decent card. Unfortunately, she had the bad luck of getting two duels that really weren’t exciting at all. One of them was in Arc 1 and the other in Arc 2. For some reason, any episode with her and Leo just couldn’t grab my attention the same way that the other duelists did. I think that making them just a little older or a little tougher would have really helped them. 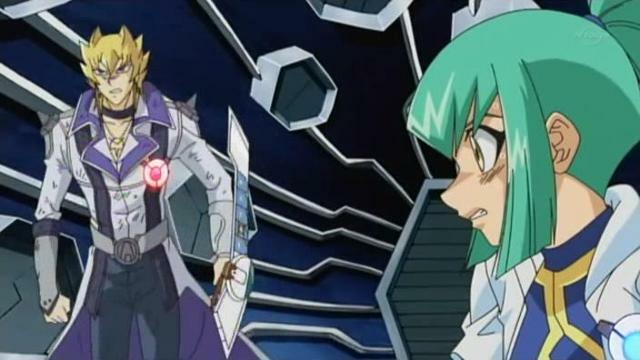 As for some of the more minor heroes, Officer Trudge was a cop who meant well as he tried to put Yusei behind bars. He just wasn’t a very nice guy who only bgrudgingly started to become friendly with the heroes by the end as he slowly turned into a comic relief character. The fun part about him was that Trudge was actually in the original Yugioh manga for one chapter as Yami Yugi wrecked him in a Shadow Game. This furthers the theory that Yugioh 5Ds is actually an alternate universe, but since Yusei met the other heroes in the crossover between space and time, it’s interesting. Yusei did see Yugi in a newspaper after all. Maybe more time travel and reality shenanigans were involved. I liked him at first, but he slowly began to lose his cool factor. His partner was also decent at first, but then she started to crush on Jack in the same way that Trudge began to crush on her so both characters dropped really quickly. Lazar worked for Mr. Goodwin for a while, but he eventually became the head of the police…or the city. I forgot, but either way he never became a very cool character for me. I dunno…I just couldn’t take him seriously and he seemed so clearly evil that his change of heart felt a little sudden. Why did he become good? The show never did a great job of showing what caused this turnaround. All right, now we’re into the Dark Signers! Kalin was the best member as you may expect and he was a lot of fun in the series. After he turned good, we got to see his new 1 turn kill deck over in the wild west. Seriously…he won on his first turn due to a special ability that dealt 800 points of damage for each card placed face down. He placed 5 cards and boom…that was the game. It’s a pretty awesome combo if you ask me even if it wouldn’t work in a normal duel due to each player having 8000 points of life. Kalin gave Yusei a crushing defeat when they first fought and it was easily one of The most epic duels in the series. It was dark out and the personal stakes made the fight feel that much more intense. Kalin definitely had no mercy on his old teammate and the tension between them was intense. Kalin’s deck may not have been the most interesting, but he made up for that with his cool ride and elite dueling skills. Greiger was kind of a part of the Dark Signers although he came out of nowhere to quickly duel Crow. He was essentially filler although he was also in the season 1 tournament. His motorcycle was very over the top and fun to look at and he actually nearly took down Goodwin by shooting his motorcycle through the glass in the stadium. He had a decent reason for turning into a villain and even if he felt a little shoehorned into the plot, he was a good villain. Crow needed someone to fight so it may as well have been him. 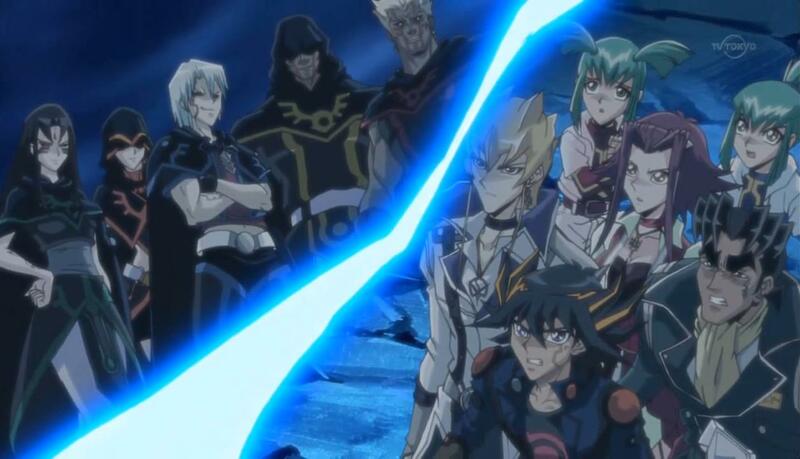 Roman was the leader of the Dark Signers and his duel with Yusei was one of the best animated duels in the show. The animation had a lot of detail in it and you could tell that it was the big fight of the arc even if the arc didn’t actually end with that fight. Roman looked tough and his dueling skills were very real. He may not have had any real OP cards like you would have expected, but he was a good leader for the Dark Signers. Another Dark Signer was Carly. She was a reporter who really looked up to Jack, but was taken out by one of the corrupt PSY users. Little did the guy know that he was sealing his own fate as she got new abilities and used the powers of darkness to end him. It was another epic moment in the series as the fatalities were finally occurring and the PSY guy had been a fairly big villain in the background. I actually liked him and at least he could back up his tough talk. Carly was mostly the comic relief in the series as a hero, so this helped to give her some much needed dueling time. As a villain, Carly was great and her duel with Jack was a lot of fun. As a hero, I can’t say that I’m a fan of her though and her screen time is typically filler. Finally, we had Misty, who was the rival for Akiza. She blamed Akiza for what happened to her brother (I believe it was her brother) and she decided to wipe out the telekinetic user with her newfound abilities. It was a good duel and while the flashback cards are certainly…intriguing, it was a very close fight through and through. She had character, which is more than I can say for Luna’s opponent. There’s really nothing to say about the guy as he just rushed into the duel and qas quickly taken down. We don’t know why he was there and fans likely won’t even care. This guy was clearly just made up to fight Luna and we got another subplot about Fairy World that wasn’t any fun. Fairy World was surprisingly boring whenever it appeared. Director Goodwin was the hidden boss of the arc and he had gotten a lot of hype for so long that it was great to see him jump into the action at the end. His super form was great and while his deck was not too memorable, it was still quite good. Goodwin put on a convincing act as one of the heroes for most of the show and while he started to ramble as a villain, I dare say that he may have been the best villain. If you still count Kalin as a villain, then I’ll go with him, but in terms of cool points, Goodwin may have this made. If we count villains who are not actually alive, then he does get beat though. Sherry was a supporting character who appeared once in a while during the series until she finally got a huge role. She’s very similar to Kourin from Cardfight Vanguard actually. She ended up learning a plot twist and joined the other side for a while. It was definitely interesting, although I don’t think that she should have even considered switching sides though. It was a very interesting dilema though and I’ll certainly go into it a little at the end. She was a good character though and I admire her fighting spirit as she even had a quick scuffle with Bruno in the real world. Sherry was a strong character and I always like to see that. Being bold is a good way to claim victory! Z-One is the final boss of the series. The show does a good job of strongly hinting the whole time about a certain twist involving another Yusei for so long. It was great as the show kept up the act and did it very subtlely so that you didn’t really have much reason to doubt the twist. Z-One’s goal is also nice and complex so he’s not your average villain. He’s doing this for what he considers to be a heroic goal. The death of a relative few to save millions in the future. We’ve heard it all before and you have to decide if you take this Utilitarian position or if you want to fight to avert the future, but risk everything. This complexity made the final battle even more epic. Not to mention that zooming around the sky with inverted gravity also added to that effect. The climax just kept on going and going with each episode getting more intense than the last. Aporia was another awesome villain. Technically, he’s a villain combo, but at the same time, he claims that this is his original form. Time travel stuff. He looked a lot like Paradox in this mode and it was cool because we actually got to see Paradox as well for a quick cameo. This guy was certainly a powerful fighter and he put up quite a good fight against the heroes. He did everything to help his friend, which was a really neat twist since it shows how sometimes the villains can have strong bonds between them as well. After all, they didn’t consider themselves to be villains even though they put on a big production for the heroes. His first appearance was definitely something that will widen your eyes as it was a very epic moment. Jakob was essentially the leader of Yliaster and he wasn’t quite as charismatic as his two teammates. He was the old and wise member of the group who wasn’t hot headed anymore, but it came at the expense of his character. I suppose that the team needs a reserved member like that, but it doesn’t make him any more fun. Likewise, I wasn’t a big fan of Lestor. He was the happy, kid member of the group and he had a nifty skateboard, but I was never impressed with his skills and found him to be a bit of a lightweight next to the others. Primo on the other hand, now this was a pretty epic fighter. He really meant business and also defied the plan that the other two members had at one point. He just really wanted to beat Yusei and nobody was going to stand in his way. 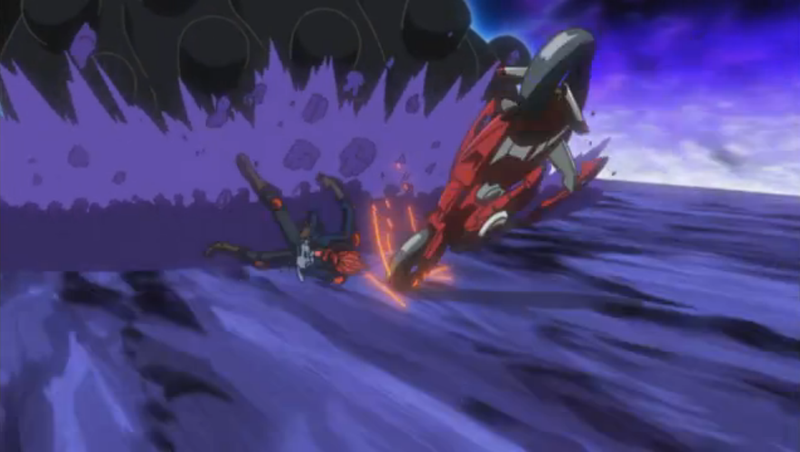 His super form of merging with his vehicle was cool and all of his duels were Awesome! I’m really glad that he defied orders in his duel as it just shows that his personality is the kind that I like in my villains. He’s similar to characters like Grimmjow, who just do what they want, regardless of orders. As for Visor, he was a mysterious figure who appeared towards the end of the series. The viewers knew his true identity for a while as he fought Sherry and appeared in the background, but the heroes didn’t figure this out until the final part of the series. As Visor, he was pretty cool and he taught Yusei how to upgrade his skills to the next level. Without that form of dimensional summoning, Yusei would have been doomed in the final battle. The legal aspects of this kind of summoning are a little intriguing though as it almost doesn’t seem fair, but it does give you an incentive to drive a little faster. Visor came in handy against Ghost as well. The Ghost is actually my favorite villain in the series. Again, this only counts if you believe that robots can be characters as this guy was awesome, but he was technically not alive. His role wasn’t very huge either, but his first duel against Yusei was one of the best in the series (I use that phrase a lot, but the series was over 150 episodes so it’s fair enough) and I liked his design a lot. This guy meant business and most of the characters in the series could not have matched up against him. As for some of the teams in the World Cup, Team Unicorn was pretty interesting. Yusei’s team had to overcome quite the massive lead that Unicorn had as Yusei essentially had to win a 1-3 battle. Really, he shouldn’t have won that match and the episode even shows us this as Unicorn could have won, but he wanted to win mano a mano and that was his mistake. Even then, Yusei probably should have lost, but it still shows just how tough he is that he can beat 3 duelists. Jack and Akiza certainly didn’t pull their weight there, but everyone has off games once in a while. Team Ragnarok was another impressive team who wielded powerful cards like Odin and Loki. They were actually a little important to the plot as they wanted to stop Yliaster themselves. Their eyes made them able to see the villains similarly to how the Crimson’s Dragon power helps the main heroes. That being said, Yusei’s team needed the win and the battle was quite spectacular. It was some of the final episodes that the Dub aired so it was a big farewell to that side of the show. The duel was one of the best in the series. Team Taiyo quickly deserves a mention as their team gimmick was pretty interesting. Rather than use the same overpowered cards that everyone else had, they wanted to win using basic cards. In part, this is due to the fact that they don’t have a lot of money. They were naturally doomed against Yusei’s team, but they still put up a decent fight and were actually likable even if their whole gimmick was just a bit much to swallow at times. Using basic cards is cool….but I don’t see how they made it so far in the tournament that way. Yusei’s decision to fight Z-One was a good one in my opinion. The tricky situation was that dueling would inevitably overload the generators someday, which would cause a global incident on a nearly extinction level. The robots and duel monsters would turn against humanity and the world would really be doomed. Yusei decided that he would defy this though. I agree with his choice since Yliastor would have blown up a city, but I disagree with how he handled it. What did Yusei do? He built more generators after the timeskip and is making the cities more high tech. As more people continue to duel, this essentially makes it inevitable that the world will perish. So, I think Yusei could have done more to avert the future, but either way, Earth can’t last forever. They may as well play the card game while waiting for that to happen right? Now, I know that it’s a little controversial to have this show over the classic Yugioh. I think almost everyone would agree to this one beating Zexal and GX being over 5Ds is something that most people wouldn’t agree with either. The Yugioh Duelist manga was extremely awesome and would beat 5D’s, but at the same time, 5Ds just had more epic moments. It had the better animation and the better soundtrack. Yugioh has the slight edge in characters thanks to Yami Yugi and Kaiba, but even then, the rest of 5D’s supporting cast beats Yugioh’s. 5Ds was just more exciting even if it was shorter. It took a while to finish the series, but Yugioh 5Ds is a title that I will definitely not forget. The grand scheme of the show can only be matched by few titles and even less can say that they’ve had a climax that was quite as exciting for such a long duration. Overall, Yugioh 5D’s is a fantastic show. While it loses to Yugioh GX, it could have easily been a 10 due to how good it is. I placed 5 shows ahead of it, GX, Madoka Magica, Digimon Data Squad, Justice League and Cardfight Vanguard, but it’s extremely close and you could make a decent case for it to pass Madoka and Justice League. There are so many epic moments throughout this series and even the comedy episodes and filler titles were typically a lot of fun. This is mainly due to how exceptional the writing is and how enjoyable the characters are. This is really an all star title! After a while, with so many legendary shows, some of them just have to give. Even if I have 5D’s at 6th place, that’s still very impressive. With great animation, a superb soundtrack, and a whole lot of episodes to sift through, you should absolutely start this series. Trust me, you will not regret it! This entry was posted in 9 Star TV Shows, Reviews, TV Show Reviews, TV Shows and tagged Action, Anime, Anime Review, Duel Monsters, Greatest Anime of All Time, Review, TV Show Review, Yugioh 5Ds, Yugioh Review, Yugoh, Yusei Fudo by dreager1. Bookmark the permalink. No, he wasn’t. He never had a 1 turn kill deck, Lawton had. Kalin(Kiryu) had an infernity “handless combo” deck. It was the same thing though. It managed to secure him the win in 1 turn and it was Crispy!